The salad for todays blogging is a salad filled with proteins and great taste. If you can’t get edamame bean in your local super market, you can try to look in one of the many Asian grocery store. If they fail to deliver too, you can replace the edamame beans with horse bean or peas, but remember that the taste of the salad will change, as the beans are the main ingredient. 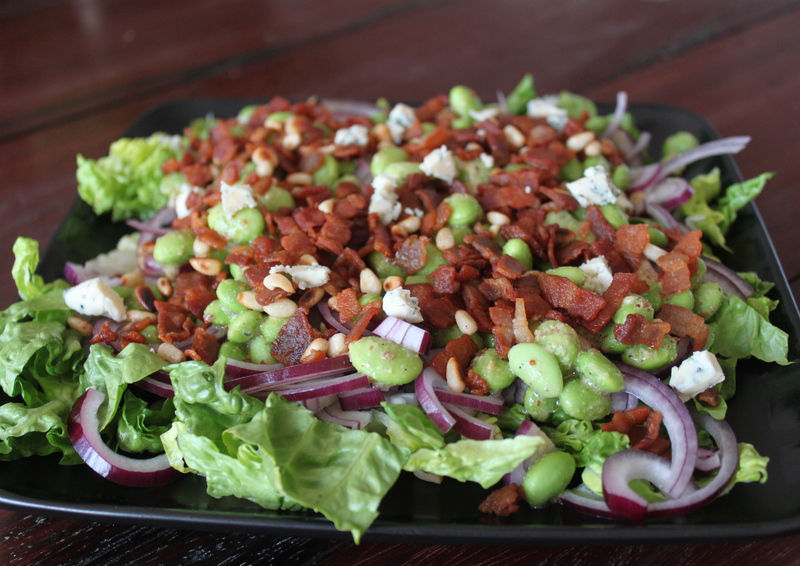 Shred the romaine leafs and arrange on a plate, followed by the edamame beans and the sliced onions. Combine the mustard, vinegar, sugar and olive oil in a bowl. Stir for a few seconds and season with salt and pepper. Pour the dressing slowly over the salad. Cut the bacon into thin slices and fry on a pan. Transfer the fried bacon to some paper towel to let the fat drip off. When all the fat has dripped off and the bacon is crisp, sprinkle it over the salad. Finish up the salad by crumbling the blue cheese over the salad followed by the roasted pine nuts. Are you eating fish regularly as recommended? Well, we try to but must admit that we don’t get as often as we would like. When we ask others, they say the same and also says that it is too expensive or they have trouble finding quick and easy recipes. 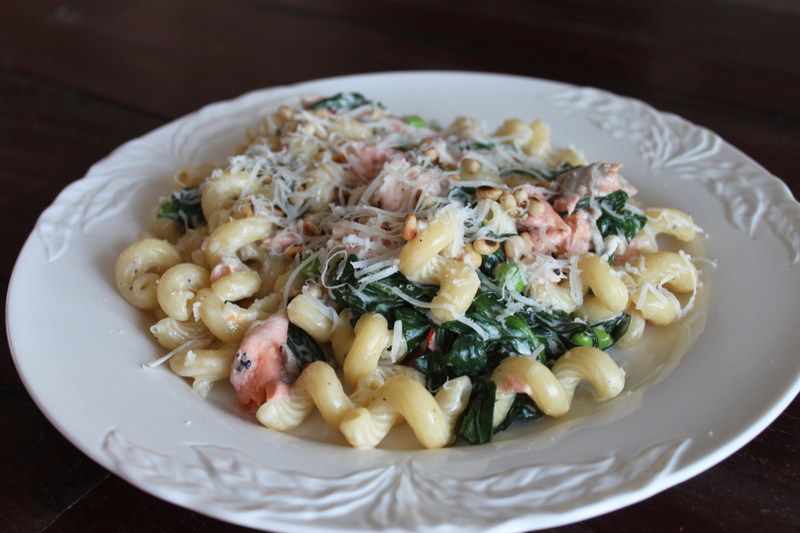 This we are about to change with this 30 minute-guest-worthy pasta dish with spinach and salmon. We will, in time, make many more easy dishes with fish and shellfish and you are very welcome to leave a comment with suggestions or link to great recipes 🙂 Hope that you will love the dish as much as we do! Clean the salmon in cold water and try it with paper towel. Season with salt and pepper and fry the skin side of the salmon on a dry pan until golden and crisp (4-5 minutes). Cover in tinfoil and bake in the oven at 350F for 15-20 minutes. While baking the salmon you can make the rest of the dish. Cook the pasta as recommended on the package and let drip of in a colander. Bring cream, lemon juice, garlic, chili and shallots to a boil and cook for 5-7 minutes at medium heat before adding the spinach. Cook until all the spinach has “collapsed” and season with salt and pepper. Then add the peas and the drained pasta. Stir to combine. Take the salmon out of the oven after the recommended time. Remove the skin a pulled the meat into small pieces. Add the pulled salmon pieces to the pasta and spinach and stir gently to combine. If you stir to much you might ruin the salmon pieces and the dish will appear less delicious. Begin by cleaning and cutting the cauliflower into bite-sized bouquets. Roast in olive oil at medium heat for about 15 minutes. 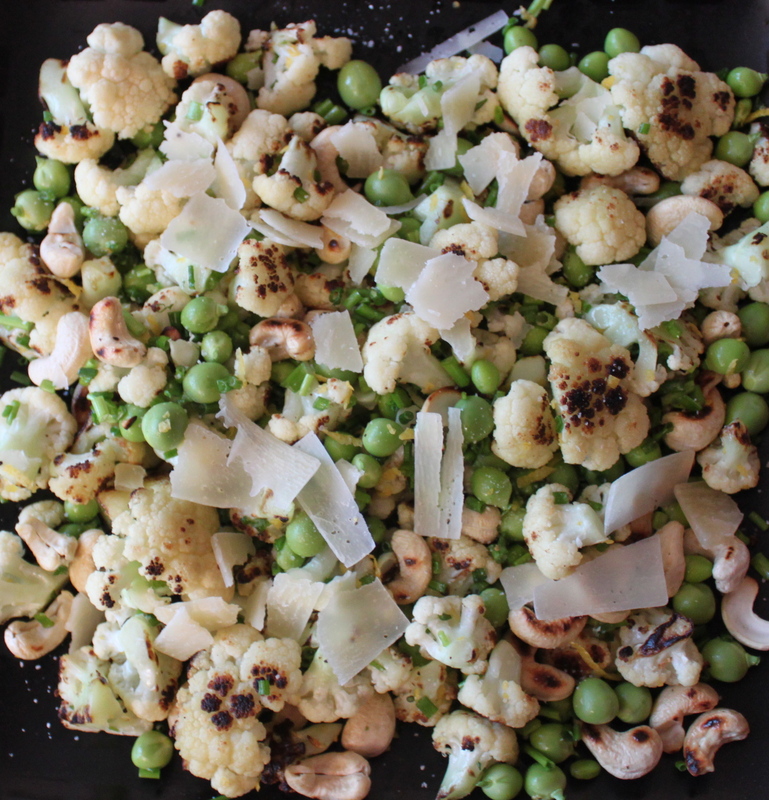 Place in a bowl together with peas, lemon zest and chopped chives. Roast the cashew nuts on a dry pan and add to the rest of the salad. Toss the bowl to mix all ingredients and season with salt. Arrange on a plate and sprinkle with parmesan flakes. Serve with good slice of bread. Everyone who’s ever worked with chocolate knows, that if there accidentally comes a drop of water into the chocolate it is ruined! So, how is it possible to make a chocolate mousse based only on chocolate and water? Well, it is easier than you might think and something that everyone can make. When that it said, there are a few thing that you need to keep in mind when considering this recipe 1) as the mousse only contains chocolate and water, it don’t get the exact same consistency as a mousse filled with eggs or cream, 2) it has a very concentrated chocolate taste, and you will only need a spoonful or two to get satisfied, and 3) as it has this very concentrated chocolate taste, it is important that you use a good quality chocolate. I alway use chocolate from Amedei, as it has a clean and fabulous taste (and it don’t contains any artificial additives). I will recommend every to try this chocolate at least once in their life 🙂 And remember, you get what you pay for – good quality chocolate is more expensive than bad quality chocolate, but it is also much better and you don’t feel the need to eat as much, as your senses get satisfied when they taste good quality. Slowly melt chocolate and water in a heat proof bowl over a pan of simmering water. While the chocolate is melting, you can prepare a bowl with cold water, ice cubes and salt. The bowl needs to big enough, so the the bowl with the melted chocolate can stand in it, while whipping it into a mousse. Place the bowl with the melted chocolate and water, in the larger bowl with ice water. 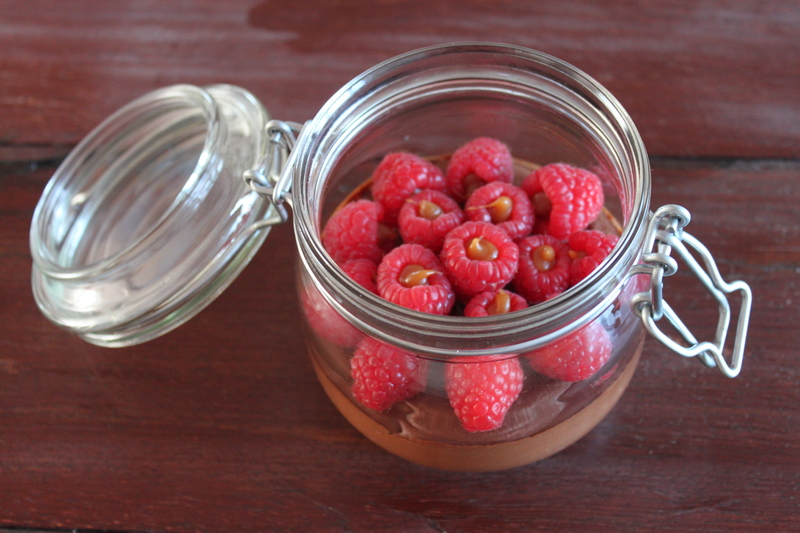 Use a hand-mixer to whisk the melted chocolate into a mousse. Whisk until it has the same texture as a whipped cream. Fill the mousse into 1 large or 4 small glasses and fridge until serving. 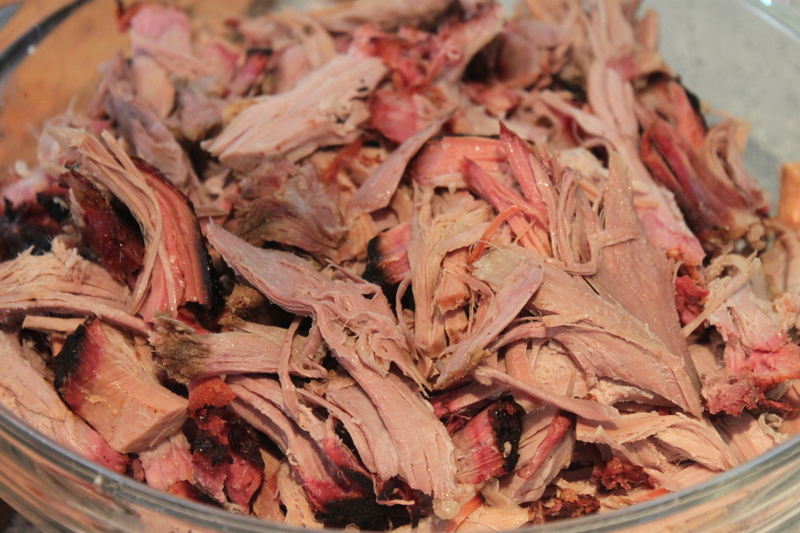 How often do you think about making pulled pork but don’t know how to find the perfect recipe? Well, we have had pulled pork a dozen places, but nothing is as good as this home made version – and we have never had any complaints, on the contrary people love it and we are often asked if we can make it for different occasion. 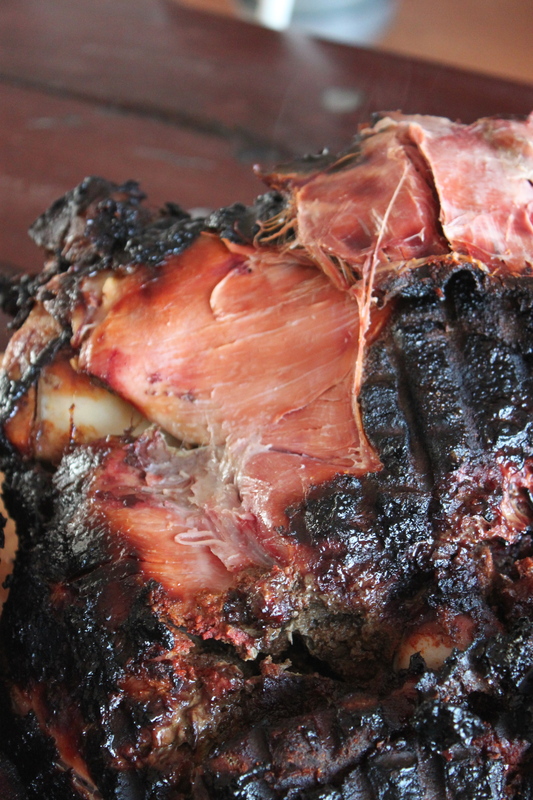 Don’t give up beforehand when you go through the recipe – it takes approximately 4-5 days to translate the raw ham into the perfect pulled pork, but it is definitely worth the time! And if you get a properly sized ham, you will have food for 4 people for at least a week! On the pictures below, there are two hams, but the recipe is only for one! And no matter the size of the ham, the smoking hours are the same, but we recommend that you order a good large ham at your butcher. 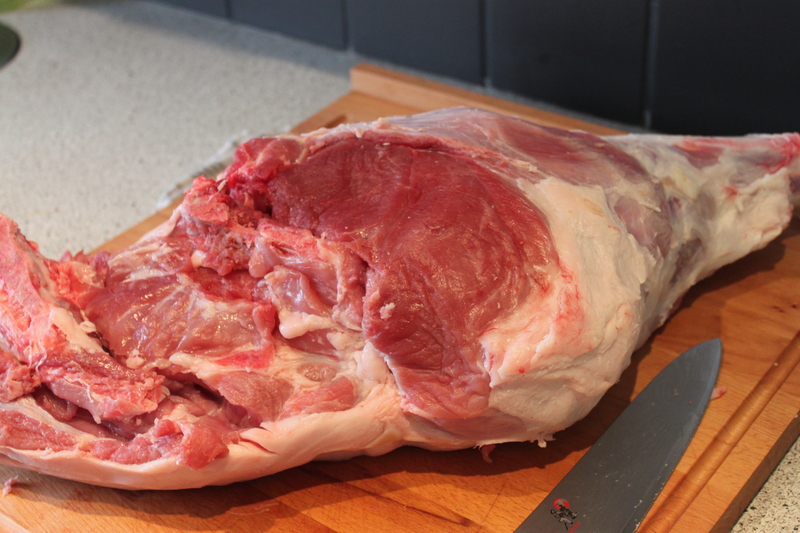 If you have gotten a whole hindquarters like shown on the picture above, you can begin by removing the tale and tale bone. 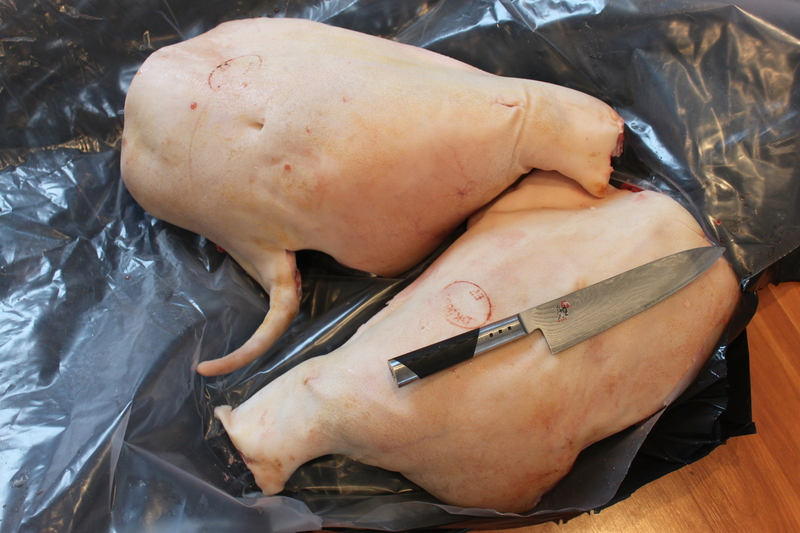 Then you need to remove the skin, but not the fat (picture below). 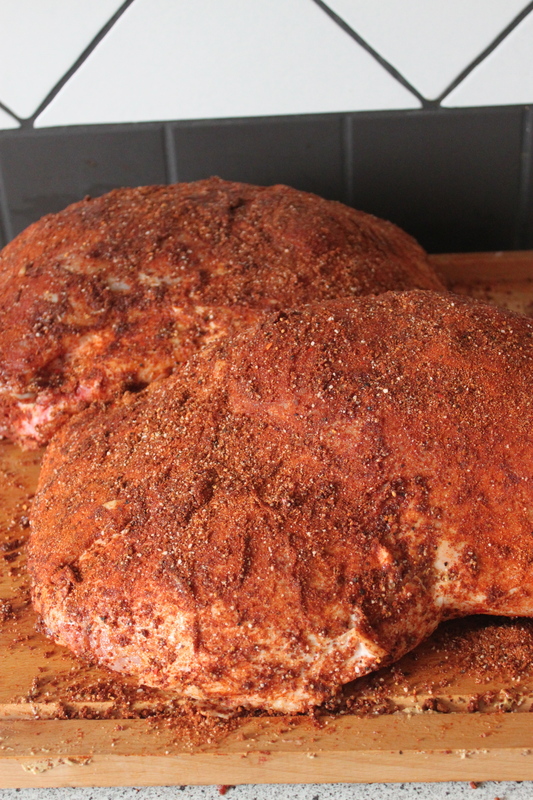 Spread out the mustard and worcestershire sauce followed by the rub. Place the ham in a dish and cover with plastic wrap. Refrigerate for at least 24 hour (preferably 48 hours). 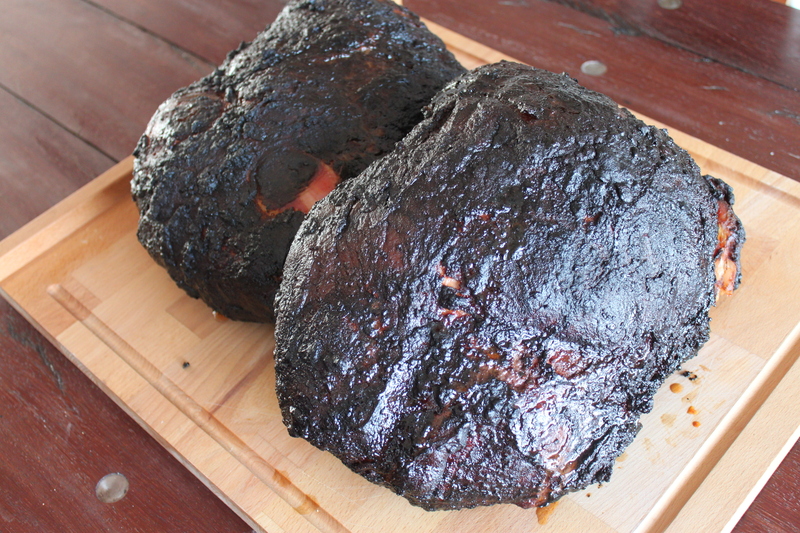 When the ham had marinated for at least 24 hours, you can begin to prepare the smoker. Place a small number of hot coals on top of a full charcoal chamber of unlit briquettes. Use the bottom vents to control the amount of air entering the cooker, to keep the fire burning low and steady. 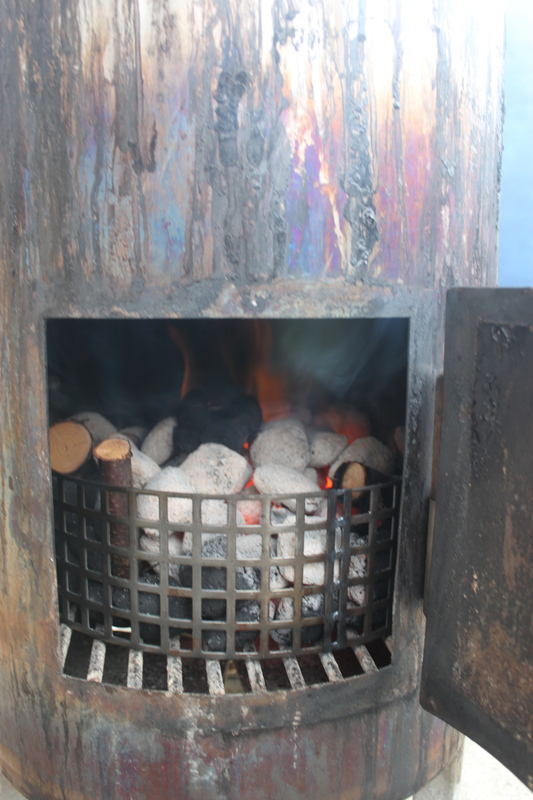 The unlit fuel catches fire gradually throughout the cooking session, resulting in long burn times of up to 18 hours, depending on weather conditions. This is called the Minion Method. 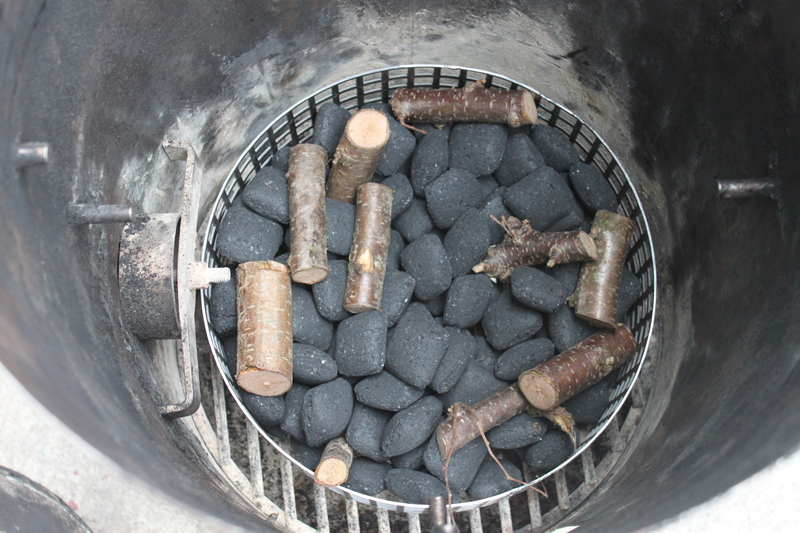 Place some wood on top of the charcoals (preferably nut tree). Fill the water pan with water and check regularly (every 6th hour) to make sure that it doesn’t dry out. Place the ham in the water smoker and put on the lid. Try to keep the temperature around 230F at all times. 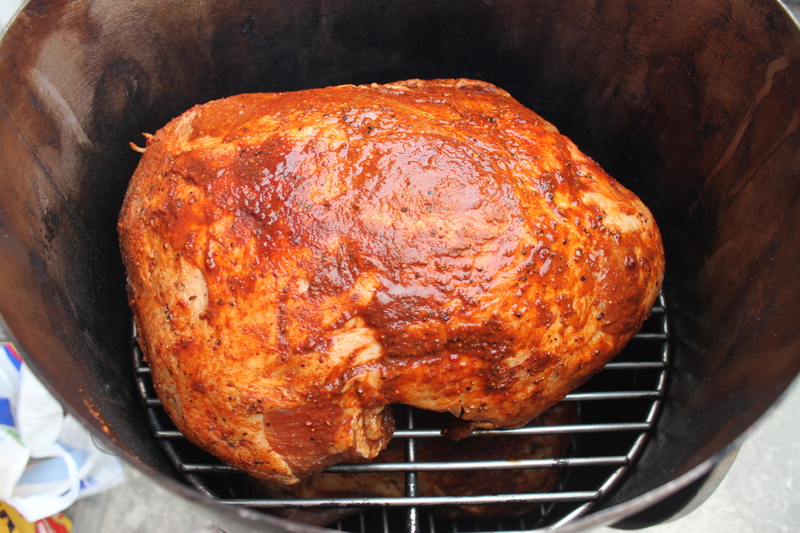 It is important that it don’t get below 210F at any time during the smoking process. If you have trouble keeping the temperature up, you can add a few charcoals at a time. How delicious does that look!?!?! 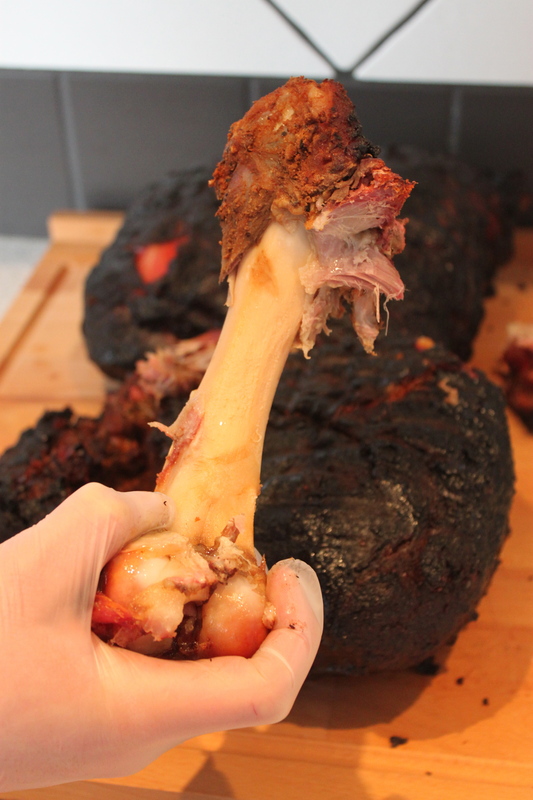 After 18 hours of smoking you know that the meat is perfect, if you can remove the key bone in one grip, without any meat hanging on to it. With the key bone removed, you are now ready to pull the meat. Use your fingers to pull the meat into small bite-sized chunks. Looking at the picture below, you can se how the smoke has gone all the way into the meat, and not just stayed on the outside. This is due the long smoking process. 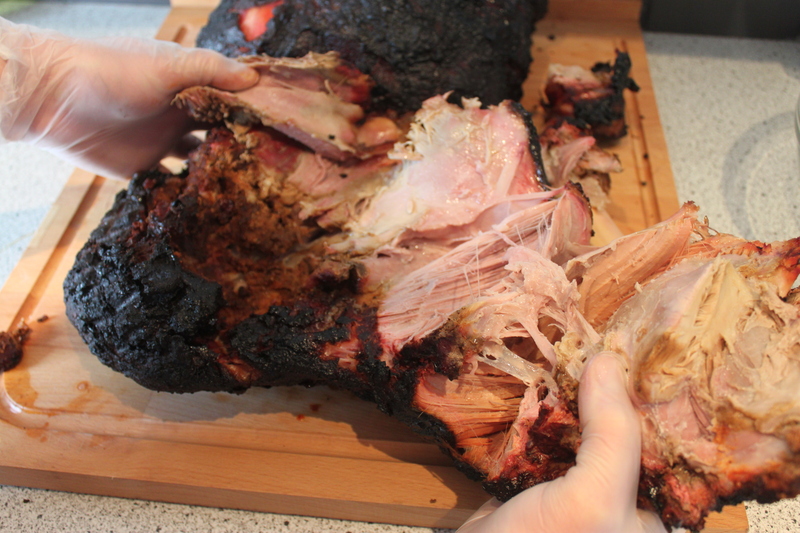 Now you have made the famous pulled pork – how hard was that? So now, you don’t have any excuse to take short cuts, as we often experience people do, when they either boil the meat or cook it in the oven in a roasting bag (shame on you)! 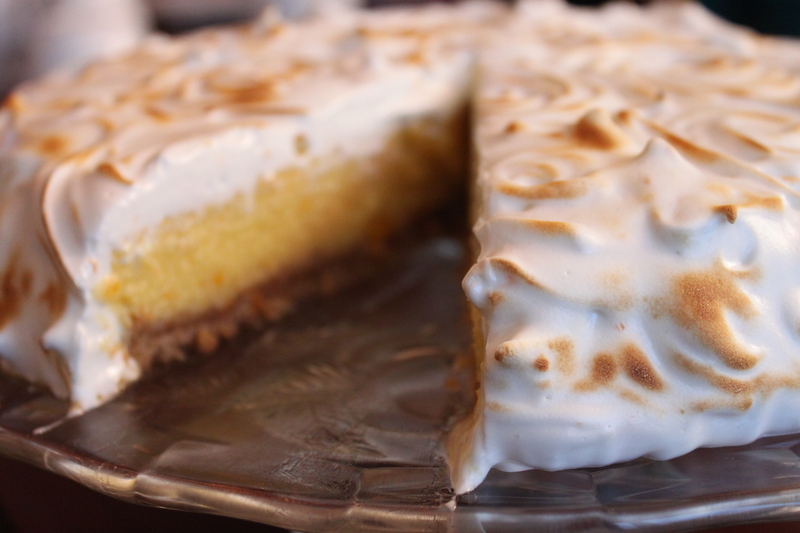 A while ago I discovered Kirstens blog and the most delicious orange cream pie. I promised myself that I would make it some day, but with Italian meringue instead of whipped cream. Melt the butter in a sauce pan at medium-low heat. Set aside while preparing the rest of the crust. Place the biscuits in a plastic bag together with flour, brown sugar and salt and crush it with a rolling pin. Combine the crushed biscuits with the melted butter and water and mix until a moist crumb forms. Cover a 9 inch springform pan with baking paper. Press the crumbs evenly into the bottom of the springform pan a fridge for 10-15 minutes or until the oven is warm. Bake at 175F for 10 minutes or until golden. Let cool while making the orange curd. Begin by stirring together the sugar and orange- and lemon zest. Press with the back of the a spoon to release the oils from the zest. Beat the orange sugar together with the butter, cornstarch and salt until fluffy (I use a stand mixer). Beat in the eggs one at a time until blended. Gradually stir in the freshly squeezed orange- and lemon juice. Stir until combined. Transfer the mixture to a sauce pan and cook at medium-low heat until thickened. Stir occasionally to avoid burning. Poor the thickened orange curd into the springform pan and cover with a piece of baking paper. Fridge for 4-5 hours before removing the cake from the form. Whisk the egg whites until it forms soft peaks. Set aside while cooking the sugar. Place sugar and water in a sauce pan and cook until the temperature reaches 230F. Pour slowly into the egg whites while whisking. Whisk until mixture has room temperature. It takes about 10 minutes if you use a stand mixer at medium speed. Add the vanilla extract and orange zest and whisk for a few more seconds. Remove the cake from the spring form pan and cover it with the Italian meringue. Fridge until served. 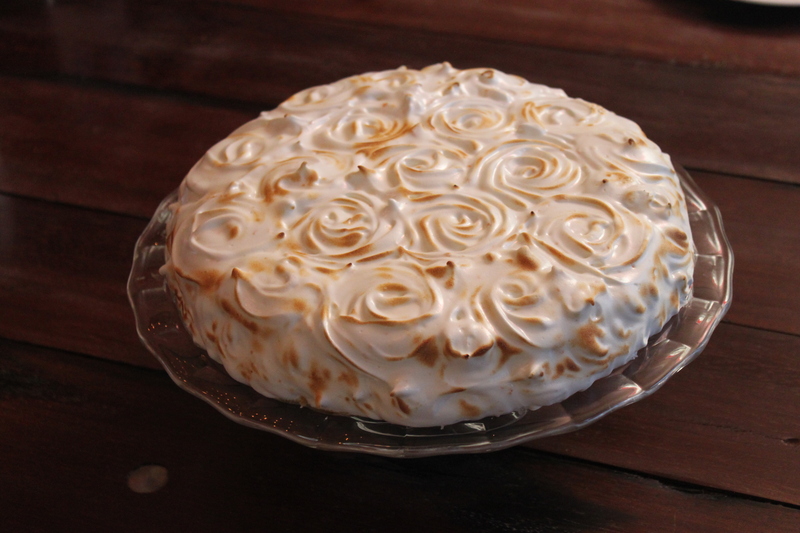 Use a gas burner to burn the outside of the meringue just before serving. When that is said, we rarely the make the same version twice in a row – not because it isn’t delicious, but because the to-do-burger-list is large! This time, we made believe that we have overcome our own burger expectations – this triple cheese burger is without doubt a favorite! Cut the minced beef into 12 equally sized pieces and knead gently to combine. Form each piece into hamburger patties. Season with salt and pepper on both sides and set a side while preparing the rest. Chop the onions finely and slice the jalapeños and pickles. Grill the patties on a pan 2-3 minutes on each side. Place the already grilled patties on an ovenproof plate and keep warm in the oven (no more than 210F), while grilling the remaining patties. 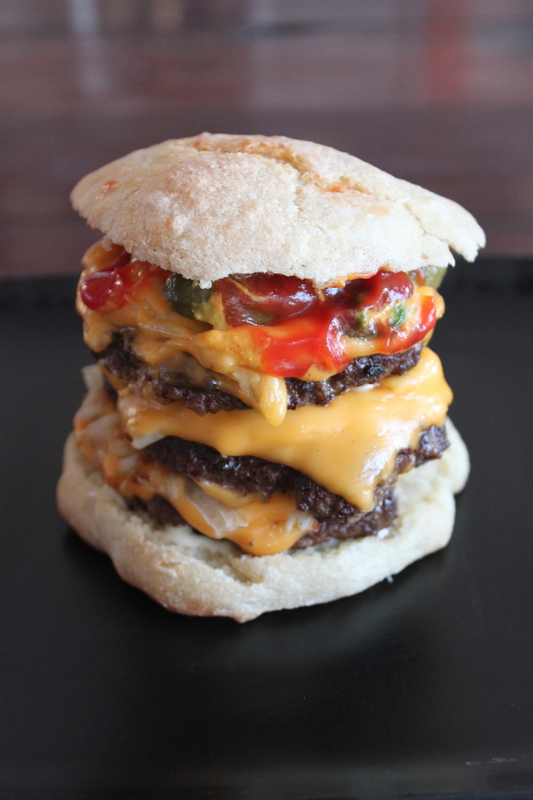 Divide the copped onions on top of all the grilled patties, followed by jalapeños and a slice of cheddar cheese. Put the onion and cheese covered patties back in the oven until the cheese is melted. While grilling the patties, you have time to warm the burger buns (I will give you the recipe for these easy buns next week). Slice the buns and spread out some mayo on both the bottom and top. Place three patties on top of each other on the bottom bun, followed by the sliced pickles. Add the wanted amount of ketchup and yellow mustard and finish with the top bun.